Lift weights, get dates, do curls, get curls, sun’s out, gun’s out. You’ve probably heard those clever plays on words before, probably being used in a humorous way but never the less the message appears to be clear, and that is that as far as desirable body parts are concerned, the general consensus seems to be that the arms or “guns” as they’re sometimes referred to as, are up there as being some of the most popular. If you ask people to flex their muscles for you, they’ll almost certainly flex their biceps. When judging the muscularity of a person one of the first things you notice is the size of their arms. Working your arms is hugely beneficial and not just for aesthetic reasons either, yet many people just don’t seem to follow the right training program or routine. To build muscle you need to work all of the major body parts, including the arms. 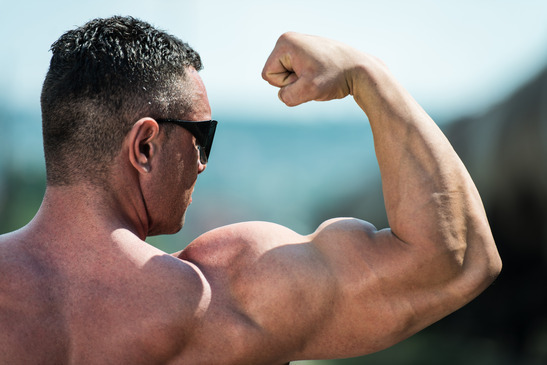 If you’re looking to add inches to your guns this summer, try following this arm workout routine once a week and within six weeks you could have gained up to 2 inches on your arms. There are three main areas of the arms – Biceps, Forearms and Triceps. We will do the biceps and forearms together (as they are closely related. For bigger forearms you should also do deadlifts), and also triceps exercises. EZ bar preacher curls are great for shaping and sculpting the biceps, especially their peaks. Grab an EZ bar close to the handle and take a seat on a preacher bench. You may need somebody to hand you the EZ bar if your arms aren’t long enough. With both of your upper arms placed against the preacher bench pad, grab the EZ bar and hold it at around shoulder length. Next, inhale and slowly lower the bar until your arms are extended and your biceps are stretched. Breathing in, curl the bar back up to shoulder height and squeeze the biceps hard for a second or two. Repeat for a further 3 sets of 8 – 12 reps.
Dumbbell hammer curls are great because they allow you to work the biceps, as well as the forearms at the same time. Take a dumbbell in each hand and stand upright straight. Make sure your arms are fully extended and hanging at your side, with your elbows close to your body and your palms facing your body. Making sure to hold your upper arm still, breathe out and curl the dumbbells forwards and upwards whilst squeezing the biceps. Curl them all the way up until the biceps are completely contracted and the dumbbells are both at shoulder height. Hold for a second or two and squeeze the biceps before slowly returning the dumbbells back down to the starting position. Repeat for a further 3 sets of 15 – 20 reps.
Barbell curls are often ignored in favour of EZ bars or dumbbells, yet they’re great for building mass and working the triceps and the forearms at the same time. For that reason, we’ve included them in this program. Begin by standing up straight whilst holding a barbell with both hands just wider than shoulder-width apart. Your elbows should be close to your body and your palms should be facing forwards. Making sure to keep your upper arms still, curl the barbell forward and upwards whilst squeezing the biceps as you lift the weight. Curl all the way up until the bar is slightly higher than shoulder height. Hold this position and really focus on squeezing the biceps before slowly lowering the bar back down to the starting position. Make sure you keep you back straight during this exercise and don’t rock or lean back to help gain momentum. Repeat for a further 3 sets of 8 – 10 reps.
Skullcrushers get their name because they involve bringing a weight down from up in the air and stopping an inch or two away from your skull. They work the triceps amazingly well and should only be performed with a weight you can manage and with very strict form. Lie on a bench and lift an EZ bar and hold it in position with your elbows tucked in as close to your body as possible. Making sure that your arms are perpendicular to the ground, keep the upper arms stationary and slowly the bar downwards by allowing your elbows to flex. As you perform this part of the exercise, make sure you inhale. Lower the bar downwards and stop once the EZ bar is an inch or so just above your forehead. Extend the elbows and slowly lift the bar back to the starting position and repeat for a further 3 sets of 8 – 12 reps.
Triceps pushdowns are arguably the most popular exercise when it comes to the triceps, and they just also happen to be one of the most beneficial. Start off by attaching an angled or a straight bar to a high pulley cable machine and grab the bar with an overhand grip of shoulder length so that your palms face the ground. Stand almost fully upright but leant forwards ever so slightly, bring your upper arms and elbows as close to your body as possible. Your forearms should be pointing towards the pulley as you grab hold of the bar. Next, using power from the triceps, push the bar downwards until it slightly grazes the front of your thighs. Your arms should now be perpendicular to the ground and fully extended. Make sure that your upper arms remain still next to your body so that only your forearms are moving. Once the arms are contracted, hold and squeeze for a second before slowly bringing the bar back up to the starting position, breathing in as you do so. Repeat for another 2 sets of 20 reps with one minute rest in-between sets.